April 3, 2019 April 2, 2019 Rev. Robert Moeller, Jr.
October 29, 2018 Rev. Robert Moeller, Jr.
One of the quilts made for Pipestone County Hospice. “A remnant chosen by grace.” Whenever I hear the word “remnant” a slight shiver still goes up the back of my neck, though it’s been over fifty years. With its wonderful assortment of candy and toys, the Ben Franklin store in Flandreau was usually a great place for a six-year-old boy. But not on the days when my mom was getting ready for a new sewing project. For a young boy who would rather be outside with his Dad doing chores, there are few things worse than standing in the fabric department, quietly waiting for your mother as she shops for material. The first place to which Mom always would head was the remnant table. Though I’m sure the whole ordeal scarred me for life, and I’ve managed to blot out most of the details from my mind, the experience did provide some important life lessons. Though the dictionary definition of remnant is “the small remaining quantity of something,” I quickly learned that remnant actually means “good deal.” Following patterns that fit children from the ages of 4 to 6, my frugal stay-at-home Mom could find enough fabric to make several shirts and dresses for very little money. I’ve since applied the same strategy when looking for smaller sections of carpeting or linoleum or scraps of wood. Perhaps one of the most common uses of fabric remnants today is for quilting. I know many of your societies and/or congregations have quilting groups. A group that meets here at Our Saviour’s makes quilts for the Pipestone County Hospice House, using donated materials. What is not big enough to make an article of clothing can be pieced together with squares of other remnants and make a beautiful, warm, comforting quilt. A stay-at-home mom or quilter can do a lot with a remnant… but God can do so much more. Time and time again, throughout history, God, with a remnant, chosen by grace, builds His Church. From Paul’s description in the verses prior to our text it is obvious that Israel as a nation is in serious trouble for their repeated rejection and apostasy. Through Moses, the Lord had declared: “I will make you jealous of those who are not a nation; with a foolish nations I will make you angry.” Through Isaiah that Lord declared: “I have been found by those who did not seek Me; I have shown Myself to those who did ask for Me. 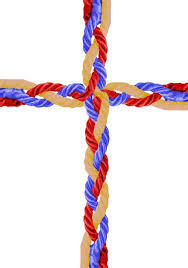 But of Israel, He said: All day long I have held out my hands to a disobedient and contrary people” (Romans 10:18-21). Given all that, should Paul give up on them? Or a more pertinent question: Has God given up on them? Paul answers his own question with a resounding no, first offering himself and his apostleship as an example of God’s ability to work His saving will under difficult circumstances; and then, going back to the situation at the time of Elijah (1 Kings 19). Despite Elijah’s God-given success against the prophets of Baal, Israel as a nation, did not rally behind him. Instead, they aided and abetted the enemy. Fearing for his life and feeling more than a little sorry for himself, Elijah hid in a desert cave, crying out, “Lord, they have killed Your prophets, they have demolished Your altars, and I alone am left and they seek my life” (Romans 11:3). Are we ever tempted to think or talk like Elijah? This world—our very nation—is in severe moral decline. Perversion of every kind is rampant—some even given a stamp of approval by the government. There is a low regard for the sanctity of human life. The family, a central piece of God’s design for an ordered society, is broken. And the Church doesn’t seem to be faring much better. Many religious leaders feel that Scripture has very little to say to today’s world. Others are shifting with the winds of cultural change to stay relevant, and too many who know better are afraid to speak out. We look at our congregations and they seem to be shrinking and growing older. Funerals outnumber baptisms. Regular attendance, once thought of as weekly, is now defined as twice a month, or maybe even one a month. Our communities don’t have near as many young families as they once did. And when new families do join, it doesn’t seem to take long for them to grow slack in worship attendance as the busyness of the world overwhelms them. Are you feeling like a modern-day Elijah? Alone in your beliefs. Unpopular with society. Therein lies the danger. This text isn’t addressing the blatant unbelief of the “world,” but the condition of our own trust in the Lord. Self-pity and frustration opens us up to another set of temptations. We may begin to harbor a “judgmental mentality” which sees the wrongs all around and wishes God would “do something” about it. But what about me and my sin and my need to repent? At the same time, we may be tempted to lose confidence in God’s Word. We may be led to throw up to our hands and shout: “Does God really know what He’s doing? Does God really care about me?” And then… to run away and hide. But God does not leave us alone for long. He comes to us; He speaks to us, though not in the way we would expect. Not with spectacular displays, but in the quietness of His grace. God did not reveal His presence to Elijah in the mighty wind, or the earthquake or the fire. Why not? Because the Lord was waking Elijah up from doubt and despair to a recognition of His control and His grace. The Lord’s truth was this: judgment, law, and wonders don’t convert or win back hearts. Patience, peace, and grace, do. Elijah, take Me at My Word! What was the message of the whisper? The text doesn’t tell us explicitly, but the quietness caught Elijah’s attention. The Lord was telling him not to lose confidence in God’s control. Saving souls is the Lord’s main interest, and the message of grace is His main tool. The solution to even the toughest of life’s problems is found in the consistent application the Word of God—just a whisper, not a show of force. St. John calls Jesus “the Word”—the one who communicated the will and love of God to sinners. Jesus was clear—He preached, “Repent.” He also announced, “Peace.” The Gospel works quietly—we won’t “wow” anybody into belief. We won’t argue anyone into the kingdom of God. Only the message of forgiveness of sin through Christ converts. Wake up. Take heart. Was Elijah “the only one left”? Not at all! God revealed that He had preserved 7,000 men who had not bowed to idols. Reviewing this account in his letter to the Romans, St. Paul makes this application his day (and I think, by extension, to our day as well): “So too, at the present time there is a remnant chose by grace.” Such comfort and assurance speaks directly to our fears and anxieties. We are not alone. God promises to preserve His faithful believers in every difficulty wherever they are. You are a remnant chosen by God’s grace. Purchased not with silver or gold, but with the holy precious blood of Jesus Christ. I can’t wait to see the beautiful ways He has in mind to work in you and through you. Go in the grace of the Lord and serve Him with joy. Amen. June 29, 2018 June 26, 2018 Rev. Robert Moeller, Jr. But as you excel in everything—in faith, in speech, in knowledge, in all earnestness, and in our love for you—see that you excel in this act of grace also (2 Corinthians 8:7). Most of them replied predictably: “King!” But one of them stole my thunder. “It depends upon whether or not you’re one of the sheep,” Patrick said. And he was exactly right. Both jobs are important for those who are under their care and influence. For the sheep, the shepherd is going to have much more direct impact. He serves them. They depend upon him for food and water and protection. The king might be able to help provide those things for the people of the nation, but he won’t be too concerned about a few sheep. Both positions of shepherd and king are God-given vocations—callings or stations in life. God gives the shepherd the privilege and responsibility of caring for the sheep in his flock. God gives the king the responsibility to care for the people in his nation. God gives you each of your various vocations. God created humans to work and to serve. If you look back at life before sin, you’ll find work and service there. When God created Adam and Eve, it wasn’t for them to lounge around. As He worked to serve them, they were to work by caring for creation and by serving one another. This is important: before there was sin in the world, there was work and service. To be sure, it was easier back then, as work wouldn’t be bothered by thorns and thistles, crabby customers, unreasonable supervisors, and the like; but even today, God has created you to work and serve in the place He puts you. This is true of everyone, regardless of whether they are a believer or not. Regardless of if they recognize their vocation is a calling from God or not. This means a king has no higher calling than a shepherd. If either one neglects to do his duty, those under his care are going to suffer. A doctor has no higher calling than the woman who cleans and disinfects the operating room. If either one does not take her work seriously patients may get sick and die. For Christians, this gives a completely different understanding of our daily life and a greater appreciation for all vocations. If you’re a Christian, whatever you do according to God’s will is holy, your vocation is holy and given by God for the purpose of serving your neighbor. Work should not be considered a “four-letter word,” but a gift of God. Now, if work and service are gifts from God, you can bet the devil is going to do his best to ruin those gifts and your perception of them. Look at the popular notion of work today: a job is something you have to do Monday through Friday, so that you can get the days off to do what you really want to do. But if you’re working for the weekend, you’re not going to see your job as a holy vocation, but rather as a hassle, or boring and unfulfilling. Aren’t you? Instead of rejoicing in the quality of work, you’re more likely to settle for “good enough.” Right? But what would happen if the weekend was a time that refreshed and prepared you to return to that holy vocation you wanted to do? That’s how it is, once you’re set free from the sins of sloth and selfishness. It’s another good reason to repent when you find yourself resenting the prospect of going to work. Remember: God created you to work and serve whatever stage of your life. We’ll add one more: God created you to give. Giving is part of serving. As God gives us to do to serve others, so He also gives us to give to serve others. Where the Lord gives us abundance, He also gives us the opportunity to support church and charity, to help our neighbor, to assist a relative in need. Now, if we’re tempted to deny that work is a gift from God, it’s going to be that much easier to deny that giving is a gift from God. It’s all too easy to see giving as an ugly test that comes with salvation, as in, “I have to give so that I can prove I’m not guilty of being greedy or to show I am truly thankful.” But both of those are attempts to motivate with the Law; and Law can cannot properly motivate or empower. It only kills and condemns. God created you to give, which is why the devil will do his best to prevent you from giving to others. Beware, too, because greed acts much like sloth. The less you give, the less you want to give; the more you keep, and the more you’ll focus on keeping. And rather than seeing the proper solution is giving more, you’ll be inclined to believe that happiness will be found in gathering more for yourself. The Macedonians were not like this at all. They were afflicted and poor, yet they continued to experience an “abundance of joy,” which “overflowed in a wealth of generosity.” This generous giving was an act of God’s grace in Christ. The generosity of the Macedonians was exhibited in three ways. First, they gave not just as much as they could, but even more than that. Like the widow with her mite, they had given in a way some might consider reckless or imprudent. And third: “They gave themselves first to the Lord…” The Macedonians gave something more important than money with their offerings—they gave themselves back to the Lord who had given Himself into death for them. Paul ties everything connected with giving to the grace that God has given to His people. God’s grace centers on His gift of Jesus Christ and His redemptive work on our behalf. That grace moves us to be gracious—to freely, gladly give everything, including our material goods, back to the Lord. The offerings of a Christian, then, are part of our worship, our response to God’s grace. Notice how evangelically Paul encourages the giving of the Corinthians! He doesn’t bargain with them or exploit their guilt or try to squeeze dead works out of their old Adam. He addresses the new man who loves to do God’s will and welcomes opportunities to express the gratitude of a reborn heart, as a fruit of faith. That is why Paul is careful to say, “I am not commanding you.” He does not want this offering to be given reluctantly or grudgingly, but freely and generously. It is not difficult to see that the Jesus who Paul holds up as a perfect model of sacrificial giving is much more than just a model. He is first a Savior. Through His humbling Himself all the way to death, the Corinthians are spiritually rich beyond compare. Their sins are forgiven. They are enjoying brand new lives as part of God’s family. An eternity of joy awaits them. They know all of that, but like you and me, they need to be reminded of it daily. If their eyes turn from the Christ, every area of their Christian lives, including their stewardship practices, will soon degenerate into dead works instead of being good works. To be “acts of grace” their offerings must be gifts driven by the grace of the Lord Jesus Christ. The Christ who became poor to make us rich is the foundation on which all Christian stewardship rests. He is our Savior. He is our motivator. He is our example. And in that order. Saved by His grace, we are then motivated to follow Christ’s example. Knowing the grace of our Lord Jesus Christ, we learn to be sacrificial and generous in our giving. And in the process, we are surprised to discover joy. One of the mysteries of God’s grace is that joy grows out of unselfish, sacrificial giving. The suggestion is not “Give until it hurts” but “Give until it feels good.” Only those who get beyond giving only what they won’t miss will find that joy. How much should you give? God doesn’t give us percentages or amounts. Giving is to be an act of grace. As you see needs arise—be it disaster relief after a hurricane, a family that is struggling with economic hardship, or your weekly offering, you’re created to help and to serve as you are able. Given all this, what would keep you from giving? What would prevent you from doing what God has created you to do? It might be fear, fear that if you give you may end up not having enough for yourself. If that is the case, remember to be sensible in what you give and what you keep, but also be careful that fear is not the master who dictates what you do, because fear is a terrible idol to have. It might be selfishness. You have plans for some luxuries in life, and you’d rather spend your money on those. While luxuries are not intrinsically sinful, take care that selfishness is not defeating your God-given desire to give and to serve. It might be a restless feeling that you need more than you have because you are not satisfied. But contentment springs not from having much, but from doing what God has given you to do with what He has given you. So God has created you to work and to serve and to give. But with all those temptations out there and that sinful nature within, you’ll never work and serve and give as you ought. As you do your best to do these things, you will likely avoid much of the restless desperation that haunts those who live only for themselves, but your best efforts are still hardly enough to earn eternal life. Therefore, dear brothers and sisters in Christ, abound all the more in this act of grace—“the grace of our Lord Jesus Christ.” You do not rejoice today simply in your own working and serving and giving. Those would never be enough to gain you favor with God. No, you rejoice today because of the Lord’s working and serving and giving. You rejoice today, because the Lord who created you to work and serve and give, redeemed you and is now at work recreating you in His own image through His means of grace. In Holy Baptism Jesus gives you forgiveness, salvation, and eternal life. In Holy Communion, Christ gives you His very own body and blood for the forgiveness of your sins and to strengthen you in faith toward God and in fervent love toward one another. So you rejoice this day. God created you to work and to serve and to give: therefore, your labors each day are what He has given you to do. Where sin sought to destroy those gifts and even rob you of life, Christ died to redeem you, to set you free from sin. Therefore, you are set free to work and to serve and to give. Therefore, your labors each day are holy, because they are sanctified by God. But even more, you rejoice in this: while sin still taints your work and your service and your giving, this does not harm your salvation—because your salvation doesn’t depend on your work and your service and your giving. This is an act of grace. Salvation is yours on account of Jesus Christ, because He has worked and served and given and lived and died for you. Therefore, in whatever you do, you rejoice this day to be God’s holy people, recreated to serve and give freely. For Jesus’ sake, you are forgiven for all of your sins. In the name of the Father and of the Son and of the Holy Spirit. Amen. April 9, 2018 Rev. Robert Moeller, Jr.
Easter Monday, Aimee and I went to see Paul, Apostle of Christ. The setting is Mamertine Prison in Rome, where Paul has been held because he is deemed a threat to the Roman Empire. Emperor Nero has sentenced Paul, along with a number of other Christians to death. Luke has come to visit Paul to minister to him and to record the last of Paul’s story, so that the Church might be encouraged in their persecution. While it is a fictional account, the storyline and characters stay close to the biblical and historical accounts. While I’m not going to give a full-blown move review, I will say that it is one of the most powerful movies I’ve seen. I don’t say this lightly. I’ve generally been disappointed with the quality of most Christian films.” I find many of them—even some of the more popular ones—to be weak in their plot and dialogue and acting. But I do give them credit that at least they are trying to offer something reflects the Christian worldview. I have often lamented that I wished more talented Christians would take up the vocation of writers, director, actors, and producers of our various entertainment media. These arts have such an influence on our culture that we should not shy away from them, but pursue them with excellence. I think that goal has been achieved in this film, and I look forward to seeing more. I would highly encourage people to see this film while it is still available in the theaters. Motion picture studios will produce the kind of movies people come to see. The best way to ensure more of this kind of movie is to support it with our entertainment dollars. Some have talked about using this movie as an evangelism tool, but it seems to me to be better suited to encouraging those of us who are already Christians. God’s grace is so amazing; His ways are so much higher than our ways; I can understand why some jaded reviewers or those unfamiliar with Christianity might find parts of the plot implausible. How can a man’s life be so changed that he goes from being one of the Church’s fiercest persecutors to being its foremost missionary and leading apostle? Only those who have already felt the grace and forgiveness of God in Jesus Christ, will be able to relate to it, especially its concluding scenes. I left the theater that afternoon feeling I had experienced the joy of grace and forgiveness in Christ through Paul’s eyes. I was left in awe of the depiction of the faith of Paul and other Christians who faced impending torture and death with courage and boldness. I think I now have a much better understanding of this man, who called himself “the chief of sinners,” “the least of the apostles,” who found strength in his own weakness, joy in his trials, and God’s grace to be sufficient in his suffering. I would like you to consider how we might reflect the light and love of Christ in our own community. How can we grow in our understanding and application of God’s Word so that we might develop and maintain healthy relationship within and between our congregations? What can we do to intentionally reach out to our neighbors with the Gospel? How can we show mercy and love to those in need? What needs might we be equipped to address? How can we open the doors of our congregations to the community? In the next few month, I hope we will begin to discuss such questions and begin to develop a strategy for addressing them. My prayer is that the day will come when people in the Pipestone, Jasper, and Trosky areas speak of us, they might say, “See how they love one another,” and they will be drawn to the love of God in Christ Jesus. God’s richest blessings in Christ! P.S. If you’re interest in checking out a trailer of Paul, Apostle to Christ, here is a link to one of its trailers: https://youtu.be/7DFGmw5oe0E.